I have a special recipe for you! One of the best of my pastas, LOVED by Italians is orecchiette with a sun-dried tomato pesto with pistachios! It is a yummy and deliciously creamy pasta dish that is great for parties. This is one of the easiest pastas to make. There is nothing to it if you have a food processor. Of course, if you are a purist, do pull out your mortar and pestle and grind away manually. Pestos are great, because with a few simple ingredients and a whir or two, you are done. Years ago – about 25 - when we first moved back to New York City and I followed the then new Food Channel, there was a program in which a Californian – so forward thinking when it came to cooking traditional Italian -, I believe, created a sun-dried tomato pesto, but using almonds as an alternative to the pine nuts, and… substituted half the olive oil with chicken broth. I have to say that I didn’t know where to look at that point – chicken broth in pesto took me out of my comfort zone. However, I loved the idea of sun-dried tomatoes, which at the time I hadn’t yet come across, not even in Italy. So, I decided to try it, but used pistachios, which is preferred in my household. One of the reasons why I use walnuts in my chocolate cake, instead of the more well-known almond in the Caprese cake. That, however, is another story. This is a fantastic paste with any remaining pesto to be used on crostini or a tablespoon dropped into vegetable soup or spread on a wrap or leftover bread with mozzarella and placed under a grill. It is just very, very versatile, and the taste is splendid like the sun. This is one of the favorite pastas that people don’t mind repeating and I use quite often for parties. It can be made a few days ahead and placed in the refrigerator. The amount is enough for 3 – 3 ½ lbs of pasta. An extraordinary substitute for the farfalle for a pesto is the simple orecchiette, literally little ears. That would definitely be an Italian first choice with this dish. Remember also to think about who your guests are. The amount of pasta will depend on how many people you are serving and if you know them well enough to know the quantities they might consume. You don’t have to use all the pesto for the pasta if you are serving a smaller portion. The hot cooking water will make the paste creamier and you can if you still feel it is too dry, add a little crude oil at the end. Actually, it won’t be necessary if you use the water. In a food processor add all of the ingredients except for the cheese. Add the olive oil as needed. Taste for salt, but remember you are adding cheese. I prefer to let people add salt or additional cheese at the table. Spoon the pesto into a container with an airtight cover. Add the cheese and mix in well. Don’t overdo. Italians always like to add more cheese. I used to get a bit worried when they did, as that can be a sign that they think the dish needs a little extra something. At times I just pour the additional pistachios on top and seal, as I can be forgetful and may find that I can’t find the extra pistachios until after the meal is over. Then, somehow, they just present themselves from wherever they were hiding all along. Cheeky. In the meantime, put the water on to boil. When it boils, add the salt to the water. When the water returns to a boil, add the pasta and let cook following the instructions on the box. Remember it should be al dente. Take seriously into consideration that especially with a pesto you will need to stir rapidly the drained pasta with the sauce for a few more minutes before serving to make it a bit creamier in texture, and to maintain the heat of the pasta when it arrives at the table. So, you may want to cut down by a minute or so on the actual cooking time. I would set aside approximately 1 – 2 cups of pasta liquid. You won’t need it all but better to be safe than sorry. Do check for salt halfway through the cooking process. Before pouring the pasta into the serving dish add additional pistachios and stir in. Leave remaining pistachios to scatter on top and serve immediately. Don’t forget a beautiful cluster of basil leaves on top. I like to serve it in a white bowl so you get the colors of the flag of Italy – green white and red! Recently I wrote a piece published online in Words Without Borders regarding Italy meets Jamaica . This is something that might seem a fad or a culinary proposal. It is not, but it is what has been going on in my kitchen for the last twenty-five years or more. Jamaican cooking, as is Caribbean cooking, is a real cuisine and is the result of centuries of adaptation on the part of all the many and varied culinary cultures that have taken root in the Caribbean. To these, beginning with the personal ones in my family with the most recent addition of Italian, to this culinary development or adaptation is added the love of family and love of traditional family culinary culture. Italy meets Jamaica stems from this onrush of joining not only two families but also two vastly different cultures in my kitchen. Since I am the one who cooks, my husband must adapt to my culinary palate and history, while to keep the family together I too must be open and acceptable to his culinary palate and history. Adding, substituting and tweaking spices, herbs and other ingredients here and there through the years of our marriage, I have managed to understand what are the main ingredients of Italian and Jamaican cooking: love and an understanding of family traditions – understanding but not necessarily acceptance. This recipe for Salt fish fritters (Stamp & Go) with an eye to Neapolitan cuisine is an adaptation of a dish that I love with an eye to my husband’s Neapolitan heritage. This is not fusion, but adaptation, as the former in my view requires thought, while adaptation means that the “other” culinary culture has seeped into my culinary tradition and has become a part of me. They are not separate but are integral parts of each other. The video is in Italian, and for those of you who wish to practice your Italian, do watch and listen (VIDEO BELOW), as I had a lot of fun with my Neapolitan friends making this video. The recipe is here below in English. Make sure the salt has been removed from the codfish as salt will be added later. Taste before adding any additional salt. Remove any bones and skin that are still attached. Dry carefully and shred or dice finely. Thoroughly combine all ingredients. If need be, add extra flour if the mixture is not thick enough for frying. Prepare a large frying pan and place over a high flame, adding approximately 1 cup of vegetable oil. In Italy they peanut oil or sunflower oil is a favorite. I like to use grapeseed oil that is becoming more easily available in the United States, although Italians have no idea what it is. It is usually from France. Depending on what size fritter is desired you can use a tsp. or a Tbsp. to create the fritters. Turn once when golden brown and remove when the other side is done. Place on a tray or plate lined with paper towels or wax paper. Keep warm in the oven if desired. Serve with Mango Salsa (p.) and Cilantro Sauce (p.). If served as a lunch or a seated appetizer accompany the larger fritter with thin slices of avocado and papaya. It can be served as a lunch also with a lovely mixed salad. 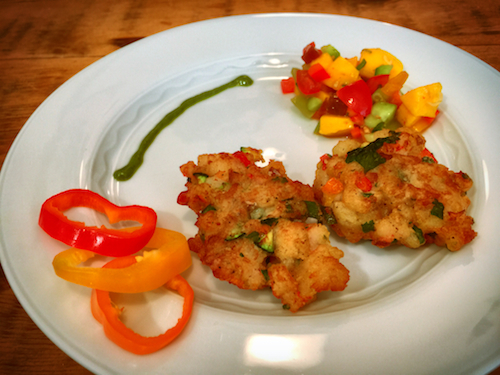 For an appetizer serve small fritters on a tray drizzling the Cilantro Sauce on top and adding a touch of the Mango Salsa on top. This dish should be quite colorful. Note: These fritters can be served hot or cold and was a dish prepared for those on the run, sailors, slaves, etc. It is great for picnics as well. They can be made a day ahead, refrigerated and reheated in the oven. Mix all the ingredients together and let sit for at least ½ hour before use. I like to serve this crunchy bright salsa with the Stamp & Go recipe. It could be used also for fried fish or chicken. This should look and taste colorful, light and fun. Place all ingredients into a blender or food processor and blend until whipped into a sauce. Additional olive oil may be added depending on desired thickness. Per JGM, nata in Jamaica, cucinare a casa significava preparare piatti tradizionali giamaicani, ricchi di influenze culinarie, incluse quelle africane, asiatiche e europee. Sposare un italiano del Sud ha significato aggiungere un’altra, definitiva, tradizione culinaria, essa stessa influenzata dalla vastità delle consuetudini culinarie regionali italiane. La vita in Italia richiedeva adattabilità, ma anche inventiva perché una donna giamaicana ha bisogno delle sue spezie, dei suoi aromi e del pepe. Grazie allo spirito coloniale della cucina giamaicana, Jacquie è stata capace, negli anni, di mescolare nuovi ingredienti e sapori alla ricerca di un comun denominatore tra due tradizioni culinarie cosí distanti. Attualmente, vive a New York, dove ha creato un salotto letterario con suo marito. I frequenti viaggi in Italia e quelli, meno frequenti, in Giamaica, mantengono viva la battaglia culinaria, che si arricchisce continuamente. L’Italia incontra la Giamaica: alcuni fra voi si chiederanno come questo incontro sia persino possibile. Nel mio caso, è iniziato con il mio matrimonio con un uomo del sud – il nostro maggior conflitto e’ sul numero delle volte in cui a casa si prepara riso, laddove lui vorrebbe mangiare pasta due volte al giorno. Tuttavia, posso dirvi che tutto e’ cominciato molto tempo addietro, addirittura prima delle prime colonie americane: il 5 maggio 1494, quando Cristoforo Colombo- il genovese – scopri’ l’isola Xamayca, il nome con cui gli indigeni Taino chiamavano l’isola che oggi conosciamo come Giamaica. Colombo era alla sua seconda spedizione verso il “Nuovo Mondo”, sempre alla ricerca d’oro e gli era stato detto che Xamayca era la terra dell’oro. Il mio sospetto e’ che stavano provando a liberarsi di lui a Hispaniola (che oggi conosciamo con i nomi di Repubblica Dominicana e Haiti) dove aveva stabilito il suo primo insediamento europeo permanente nelle Americhe, nel 1492, dopo che la sua caravella, la Santa Maria, si era arenata ed era affondata al largo dell’isola. E’ difficile chiarire i dettagli di questa storia; nonostante l’importanza strategica e politica della Giamaica attraverso i secoli – prima per gli spagnoli, poi per i britannici e, più tardi, naturalmente, per gli americani – la nostra storia praticamente e’ ignorata. Un vero peccato, dal momento che, la storia del nostro popolo, e’ davvero affascinante, per non parlare delle virtu’ della nostra arte, dall’arte visuale alla musica alla danza, e della nostra eredita’ culinaria, che risale appunto fino all’epoca dei Taino. La versione piu popolare e’ che Colombo ottenne la Giamaica come premio da parte dei sovrani spagnoli – Ferdinando II d’Aragona e Isabella I di Castiglia, i reali cattolici di Spagna che sostennero i costi delle sue quattro imprese attraverso l’oceano. Durante la sua quarta e conclusiva spedizione verso il Nuovo Mondo, nel 1503, Colombo rimase bloccato sull’isola per un anno – la sua preghiera di aiuto rivolta al governatore della vicina Hispaniola, rimase inascoltata. A quel punto, Colombo aveva molti nemici tra gli spagnoli. Inutile dire che “l’italiano” Colombo non mangiò Gnocchi con pesto alla genovese, durante il suo soggiorno forzato, e fu costretto invece a mangiare il cibo dei Taino. Forse molto del cibo che noi mangiamo sull’isola oggi, fu assaggiato anche da lui: “barbacoa” (suona familiare? ), ad esempio, era un modo di cucinare la carne che si sviluppo’ fra i Taino e continuo’ a diffondersi, inglobando influenze spagnole e africane, fino a trasformarsi in quello che oggi noi chiamiamo “carne essiccata”. Colombo, oltre che mangiare pesce “essiccato”, granchi, iguana e altri tipi di carne, probabilmente mangiava pane fatto con la manioca, sgranocchiato con delle patate dolci, callaloo, fagioli, guava, ananas e papaya. Uomo fortunato. Essendo italiano probabilmente non la pensava allo stesso modo: lui aveva solo bisogno di pasta. Gli italiani, però, non sono stati gli unici a lasciare il segno nel cibo giamaicano. A parte le ovvie influenze culinarie britanniche (incluse quelle scozzesi e irlandesi), piatti ebraici furono incorporati nel repertorio giamaicano attraverso l’influsso delle comunità siriano -safardita e libanese. Il diciannovesimo secolo vide l’arrivo di ondate di immigrati italiani e tedeschi cosi come di cinesi e di quelli che noi chiamiamo indiani orientali (il nome deriva dalla cocciuta insistenza di Colombo che, credendo di essere arrivato in India, quando invece era approdato nelle Bahamas, si convinse a chiamarle “indie occidentali”). Il posto, pero’, del cibo italiano in Giamaica, e’, sorprendentemente, abbastanza unico. Oggi ci sono numerosi ristoranti italiani in Giamaica che hanno adattato i piatti italiani alle ricette e ai prodotti giamaicani. Anche i giamaicani, poi, sembrano attirati dal cibo italiano, e conosco un numero di combinazioni italo-giamaicane, come quelle che uso nella mia cucina, che stupirebbe tutti. In Italia e’ semplice trovare i prodotti di cui ho bisogno per preparare i piatti giamaicani. C’e’ persino un sito di provviste giamaicane nel Nord Italia , per non parlare della favolosa frutta, verdura e altri prodotti che sono disponibili nei mercati romani come il Mercato Trionfale e il Nuovo Mercato Esquilino di piazza Vittorio. Grazie all’influenza della nuova immigrazione proveniente dall’Africa e dall’Asia orientale, voi avete una varieta’ di frutta e verdura spettacolare, che noi giamaicani desideriamo ardentemente. Sorprendentemente trovo la qualita’ persino superiore a quella di New York. La spiegazione piu’ ovvia per comprendere questo particolare e’ che il mercato del cibo in Italia richiede la migliore qualita’ – anche nei prodotti di importazione. Gli italiani, a differenza degli antichi romani, usano, pero’, poche spezie – soprattutto cannella e noce moscata. Oggi le spezie in polvere cosí come lo zenzero fresco, si possono trovare facilmente e, una volta, mi e’ stata servita una pasta con una salsa di zenzero assolutamente poco invitante. La cucina italo-ebraica e’ piu’ “divertente” e usa la cannella persino nel sugo con il tonno, incorporando anche uva sultanina dorata, foglie di alloro, capperi, olive e pinoli. La noce moscata e’ usata soprattutto nelle salse bianche. Grazie all’influenza degli africani e degli asiatici, esiste una vasta gamma di spezie disponibili, ma la mia esperienza e’ che sono usate prevalentemente all’interno di quelle stesse comunita’. Il curry in polvere viene usato, ma so che nessun giamaicano o asiatico rispettabile lo comprerebbe in un negozio italiano. Una nota positiva e’ rappresentata da un negozio di Roma che vende peperoncino in polvere e salse di diversa intensita’ di piccante, provenienti da tutto il mondo. Il mio modo di cucinare e’ un processo di adattamento culinario, cosi’ come loe’ stato per i miei antenati. Posso cucinare un piatto italiano, ma, quello che metto nella pentola, deve soddisfare anche il mio palato giamaicano. Le mie “aggiunte” preferite sono lime, zenzero, cipolline, tutti i tipi di spezie, peperoncino rosso dei caraibi – “peperoncino fiero della Giamaica” – e timo. Faccio, pero’, lo stesso anche nel caso inverso. A volte uso un metodo di cucina italiano per preparare qualcosa di giamaicano: le polpette giamaicane di carne con melenzane e provola affumicata, con giusto un po’ di basilico, aglio, peperoncino e cipolline. Servite con una deliziosa, densa, salsa di pomodoro, sono in grado di soddisfare un grande pubblico di italiani. Il Tiramisu alla giamaicana e’ preparato con agrumi – arance, limoni e lime – e un delizioso pure’ di mango al centro. E, al posto dei savoiardi (fatti guarda caso con un preparato di torta genovese, a conferma di un altro legame con Colombo), strati di banana a fette o di torta al limone bagnata con uno sciroppo agli agrumi. Potrei renderlo ancora piu’ gustoso con l’aggiunta di zenzero grattugiato fresco – e immediatamente (“presto” in italiano nel testo ndt) si ottiene una combinazione di sapori meravigliosa. I miei amici italiani hanno imparato ad apprezzare queste piccole liberta’ che mi prendo con i loro piatti e, a mia volta, ho imparato tantissimo dai meravigliosi italiani con cui ho cucinato. L’Italia incontra la Giamaica nella gioia e nell’apprezzamento di aromi e sapori che si mischiano, ma anche nel nostro amore condiviso per la famiglia, per la tradizione e l’arte culinaria e per la profonda semplicita’ contenuta in un pasto. I am writing beneath a tree in Italy and thinking about the wonderful visuals and aroma of fruits and vegetables that abound throughout the Italian summer season. I desperately want to pull out my copy of Preserving Italy: Canning, Curing, Infusing, and Bottling Italian Flavors and Traditions, but it is in New York, as is my kitchen, So, for now, sadly there is no possibility of experimenting with new ideas and thoughts resulting from the wonderful family and Italian memories that Domenica associates with her many and varied home-preserved recipes. When I return to New York it will be almost at the end of the season and I envy all of you near farmers’ markets filled with delicious fruits and vegetables – hopefully organic – and your kitchens. Here I am in Italy surrounded by all these mouthwatering fruits and vegetables and yet I am completely at a standstill. It makes me want to cry. So, this collection of personal recipes is a must, and Domenica has given me a few fun and flavorful suggestions for the high season of canning, curing, infusing and bottling. These are handy and versatile preserves to have on your shelves - your children are home from college, friends or family drop by unexpectedly, and why not, treat yourself. I think just the act of being able to see the fruit – pardon the pun – of your labors is worthy of you creating a few appetizers just for yourself and opening a bottle of your favorite rosé. My choices would be sweet and spicy pickled melon wrapped with prosciutto, eggplant in oil topping a crostini, or fig jam with orange zest topping your favorite cheese (mine is Manchego aged for 8 months – I know, Spanish and not Italian, but I am very global). Domenica says the aroma of roasted vegetables naturally recalls Italy. In my Italian family, sweet and sour bell peppers are served sometimes with homemade brioche – Neapolitan style. Try it on a crostini or cracker. Think about vanilla ice cream topped with her nonna’s sour cherries in boozy syrup to complete the menu of your personal indulgence. Those cherries are what got Domenica started on her research as the last bottles made by her grandmother’s preserves were jealously guarded by her mother and aunts, and no one had the recipe. Family memories are a great stimuli for cooking, as both are incredibly comforting and a source of inspiration and creativity. These recipes are fun, even though preserving in its many forms might seem daunting. To be honest I have only so far had the nerve to try the citrus infused olive oil (p. 153) as well as the citrus salt (p. 145). They are fabulous and my friends love to open the bottles and smell the citrusy perfume that comes forth. There are a few other recipes that I plan to attempt when I return to New York, like the Tropea onion jam (p. ), the porchetta salt (p.146) and even the pear mostarda (p.146). A definite must is the Abruzzese pesto (p. 172) – the Italian holy trinity of flavor base according to Domenica. It is a great start for many a Caribbean dish so will make a great addition to other items in my refrigerator. Look for the August issue of Better Homes and Gardens in which there is a lovely spread on zucchini as envisioned by Domenica. I am so excited to read it. Also click on the video of an interview I did with Domenica at the NYU Casa Italiana Zerilli-Marimò in which we discuss her love of preserving. Jacqueline Greaves Monda. Photo by Claudio Napoli. These last few months I have been on a sort of hiatus from writing. I don’t think it has been too easy for many but somehow it felt wrong to be talking about cooking. However, if there is one thing that is a basic of life, and makes us different from our beloved furry friends, is that we can cook. So, I thought to begin with something cheerful especially in these last weeks of wintry blues, like my love of citrus fruits. Well, I am from Jamaica, and I suppose the equivalent of that in Italy would be like coming from Sicily in terms of those fruit. For me lemons, limes and oranges are a must – just about all we get here in New York, with the exception sometimes of the ugli (Jamaican hybrid of orange, tangerine and grapefruit). Although when desperate I’ll purchase mandarins, especially in the month of December. My kitchen always has a bowl of some sort filled with a combination of lemons, limes and oranges. In mandarin season I decorate my dining table with them, at times filling large vases with an assortment of lemons and limes, or just mandarin. Such a perfume pervades the room. I use zest for my cakes and cookies, my salad, pasta sauces and in fish, chicken and meat dishes. The latter are usually when baked or roasted placed on a bed of herbs and slices of orange or lemon, depending. Nothing goes to waste, even though surprisingly enough I must force myself to eat oranges. But I do, chasing away the stories told as a child of the early sailors who suffered from scurvy as their boats sailed from Europe, crossing the Atlantic into the New World, until it was realized the importance of citrus. I make a light syrup whenever I have leftover citrus from my passion for zest. I drink water with several slices of lemon or lime, and following the recommendation of my friend Domenica Marchetti in her wonderful book on Italian preserves Preserving Italy, I never ever use salt again without zest. Lime is also added to her blend of lemon and orange flavored salt. Love the color combination! I am sure she thinks I am exaggerating in my use and I have also followed her advice for lemon infused olive oil. I am so crazed that I have even altered the traditional Tiramisu recipe to make it into what I call a Caribbean Tiramisu which sometimes becomes converted into a Trifle with the addition of sliced mango and pineapple, as well as chopped pistachios. As you can imagine a significant quantity of lemon and lime zest is swirled into the mascarpone sauce and layers of savoiardi cookies are gently bathed with a citrus syrup and not coffee. If you require alcohol limoncello might be substituted or even Grand Marnier for the rum. However, I think it is rich enough to just use my simple syrup. You can find a video and recipe on the website where I teach my friend Charmaine Lord of Dish Up to prepare a tiramisu. There I substitute the cookies with a banana bread that too was bathed while hot with hot syrup, and is equally packed with zest. Do find below my recipe for Banana Bread as well as for the Lemon Curd Crostata. When I think of Banana Bread so many thoughts come to mind, including tropical breezes, Caribbean sunsets and the sound of children chitchatting and laughing while running along the street to reach home in time for tea. The tantalizing aromas of warm earthy spices, cinnamon, nutmeg, ginger, and if you wish allspice, mingle with that of sweet banana floating in the air, and later are joined by the heartwarming zesty cacophony of citrus as the palate is surprised by the many layered flavors gifted by my favorites: lemon, lime and orange. Banana bread may be served simply at breakfast, or at tea. To transform this simple bread into a special lunch or dinner dessert serve it with a variety of ice creams such as vanilla, cinnamon, mango or dulce di leche, and with the addition of one or the other sauces hot caramel, hot chocolate, crème anglaise or hot orange rum sauce so it becomes something divine an sinful at the same time. Flambéed bananas are also a warm happy addition, and really, why hold back at this point? Preheat oven to 350° F. Prepare a bread pan with butter and breadcrumbs, or butter and then a non-stick cooking spray. An alternative, and what I usually do is to butter or spray the bread pan and then place at the bottom a piece of wax paper cut to size. Using a mixer cream the butter and sugar together for approximately 10 minutes. Sift together the flour with all of the other dry ingredients. Then add the eggs to the butter mixture. Gradually add the flour mixture to the first mixture, alternating with the milk that has been mixed with the lemon juice. The milk will be slightly curdled. Then by hand, add the mashed bananas and the lemon, lime and orange zest, and save the juice for making the syrup. Finally, add the vanilla, and coarsely chopped walnuts if desired. Pour into the prepared bread pan. After the allotted cooking time, test the bread for doneness by sticking a wooden skewer in the center. If still too moist, leave in the oven for another 5 minutes. Take the bread out of the oven and immediately pour on top and bottom of the bread some of the prepared citrus syrup. The hot syrup over the hot bread serves to keep the bread moist for days. Don’t forget to remove the wax paper if using. Place all ingredients in a small saucepan. Cook at low heat, stirring frequently until the sugar dissolves. Cook for another 5 minutes until the syrup thickens. Take off the heat. Pour immediately approximately ¼ of the syrup over the hot bread leaving more or less ¾ of the syrup to moisten the bread on all sides once it is cut into slices for the assembling of the dessert. - Surprisingly I have yet to find a really great banana in Italy so adding another fruit in season gives it a lift. - Fresh very ripe peaches (3) together with powdered ginger (1 tsp.) with or without the banana. It comes out beautifully and provides a bit of variety. - I also love mixing banana and pineapple. 20-oz of Lemon Curd, I like Wilkin & Sons Ltd. In a bowl, using an electric mixer beat together the butter and sugar on medium speed until light and fluffy, about 4 minutes. Beat in the eggs one at a time, beating well after each addition. Add the vanilla extract and mix well. Sift together the flour and baking powder, then add salt and zest. Add to the butter mixture a little bit at a time at low speed, and beat well until well mixed. Shape the dough into a ball. Flatten and wrap in parchment paper, and refrigerate for at least ½ hour. The dough can be prepared up to 3 days ahead, and kept in the refrigerator. Let it soften slightly at room temperature before continuing. Preheat oven to 350F. The tart will be placed on the highest shelf of the oven so as to not get too brown. Prepare a nonstick tart pan by spraying with a nonstick spray. When ready remove approximately 1/4th of the dough and keep in the refrigerator until ready to be used. Using your fingers the remaining dough should be pressed down into the pan and around the edges as evenly as possible. Remove any excess. Cover the bottom with the marmalade. Take the remaining dough from the fridge. Using some flour, as little as possible. Create 10 strips that are placed 5 first in one direction and then in the opposite direction another direction. It is not a lattice top as the dough is almost like a cookie and not easily worked with. However, it looks beautiful. Bake for approximately 50 minutes. Let cool and sprinkle with confectionery sugar. Note: Obviously you can substitute the marmalade with another jam of choice. You can also cut out shapes and be creative with the top crust using cookie cutters. I am if anything, traditional – that is regarding the restaurants that Antonio and I fortunately have discovered through friends or family and visit every chance we get. These guarantee us a specific atmosphere, consistency in the food (the whole nine yards: presentation, aroma, taste, textures and our eventual and guaranteed oohs and aahs) and where we are welcomed in a way that assures us we matter as much as the many hundreds and thousands who have eaten there since our last visit. Along the Amalfi Coast, dotted with little seaside towns, inlets, and hidden hill towns visitors are almost guaranteed an incredible feeding experience, there is one place that we return to – Maria Grazia. This we understood to be the restaurant that created the famous spaghetti with zucchini (1952) that I can assure you is out of this world. Imitations can be found in the same town, along the coast as well as Capri and within the Gulf of Naples. Don’t bother. Just go straight to Maria Grazia where you will be greeted by the great granddaughter of the famed, but no longer with us creator Donna Rosa, and other family members. You can’t miss them as they all look alike, have beautiful smiles, happy dispositions and golden tans. If you arrive by boat, perhaps one of the brothers will pick you up in his small boat and take you back and forth to yours. Through the years, other restaurants have cropped up and they too have little boats arriving like bees to the flower, but if you are in the know you will have already made a reservation and will brush them away like flies. We have been taken to other restaurants, but they won’t give you the Maria Grazia expertise and charm. We are not there for the glamor nor for the restaurant experience found in New York or Rome or Paris or London. We are in a small fishing village on the beach with little children scampering about, women in bikinis, young people playing beach volleyball and older men strolling along the shore. I will not fail to mention the brilliance of the sun’s rays sparkling on the clear blue waters, and the little fishing boats speeding from yacht to yacht. It is absolutely picturesque, especially after the meal, a few bottles of beautifully chilled local wine with just the right tone for a lazy afternoon (Falanghina for example), and beach chairs are available in which you can throw your absolutely satisfied body, face the sea and enjoy a rhythm of life we can only envy. In New York I prepare what I call an homage to this restaurant - zucchini four-cheese spaghetti dish. They have one cheese we can only dream of obtaining, fresh basil and zucchini from land that has been blessed by the sun god – this is the area of the famous cherry tomatoes (Campania Felix as the Romans called it). The recipe is only handed down in the family. I who am gluten intolerant feel justified to have at least a few bites. However, for those of you who are celiac, please do not hesitate to let them know. Be prepared for the appetizers that are huge flavors of goodness. Share, share, share and eat slowly. Out come huge platters of treccia (plaited fior di latte mozzarella), stuffed eggplant with melted cheese and lots of delicious exquisitely fresh basil leaves totally alive with flavor, lightly fried baby shrimp and squid, deep-fried breaded cheese chunks, rice balls (arancini), potato croquettes, stuffed zucchini flowers, cod fish and many other incredibly delicious traditional dishes like sautéed zucchini, bell peppers, eggplant and the delightfully huge tomatoes bursting with flavor that this land produces. These are all in the traditional local cuisine, but oh my, the flavors are filled with sunshine, love and life. The pasta is followed by huge bowls of bountifully joyous seasonal fruit immersed in ice – peaches, nectarines, cherries, also huge slices of watermelon and melon, and if you are lucky there might be early figs called fico fiorone. Did I mention that they also have incredible pastries (just look at the pictures) followed by a cold glass of limoncello or grappa and deliciously brewed espresso. Don’t think it stops there. In all the years I have eaten at Maria Grazia, I truly do not remember ever seeing a menu. Rosa - the great granddaughter - comes forth and we ask what there is and so it all starts like a whirl. Platters just keep coming out. It is a banquet, a feast to be shared. However, there are other incredible seafood pastas and there is freshly caught local fish and seafood of every type that are baked, grilled or fried spectacularly and as you desire. These we only attempt if we are able to return a second or third time within the same summer. Antonio, however, never budges in regard to the pasta with zucchini, even foregoing his mozzarella. However, here by this beautiful sea it would be strange if the seafood was not freshly caught. Happiness in a situation like this is inevitable. I assure you that once you try Maria Grazia your return is inevitable, and always joyous. Let’s face it, my favorite restaurant is da Tonino a twenty-minute brisk walk uphill from the Piazzetta di Capri, followed by another twenty minutes downhill. Chef Salvatore Aprea has no official stars – accolades aplenty - and, who adore his cooking have given ours, and more importantly sent our friends and family, returning year after year, and sometimes as in my case more than three or five times in a ten-day span schedule permitting. A bit much? I actually thought of writing a more restrained piece, however, life is too precarious and way too short to dine out in restaurants that completely leave me dissatisfied and edgy. At Da Tonino I tend to eat my favorite dishes repeatedly even if I go two days in a row. It is only if I can sneak in that third or fourth visit that I allow my curiosity for new dishes to take hold. There is always a sense of surprise and a certain wishfulness because you want more than ever to return soon to have other opportunities to appreciate these distinctive and tantalizing flavors, combinations and textures. You’ll want to return the next day and the next, and the next. Once, I went twice the same day, totally guilt free pleasure and true decadence. Our chef maintains a high standard of traditional Italian culinary techniques and flavors learnt first at the side of his brilliant father, Tonino Aprea, and later in his stints working at the famous San Domenico in Imola (2 Michelin stars) and in the kitchen of Heinz Beck (5 Michelin stars) before returning three years ago to reopen his father’s restaurant. A great restaurant for me is a place where the staff is obviously attentive and enthusiastic to be working, and are actively involved in making its clients feel welcomed. The wine cellar has over 10,000 bottles of the most impressive wines possible and connoisseurs can frequently be spotted there. Wines are also available by the glass and for those who prefer a cocktail, the bar is definitely open. Gennaro, the older brother runs the farm where the pigs are raised, and that is not all he does, and this is a family kitchen/restaurant. He is a trained biologist and spent many years doing research in Madagascar, hence don’t expect to find the use of any other type of vanilla beans, but those of Madagascar. He and his brother Salvatore are also known to experiment together creating new combinations and recipes using local flora and herbs that they gathered while foraging in the exquisitely green and luscious countryside. The concept is a modernization of traditional and local dishes, but without the loss of the essential traditional flavors and context of the innate cuisine. Freshness and purity are a must with much of their produce and herbs coming from their farm, herb garden and orchard or purchased from local farmers and fishermen. Featured fish was caught the night before and Salvatore avoids the use of farmed fish. Another important key to their success is the maître d – Maurizio, a pastry chef, fully qualified to talk to you about wines and ingredients recipe, spending as much time as possible explaining to a diner the intricacies of a particular dish and wine pairings. Recipes are enjoyed as much as the actual dish. His enthusiasm and good humor increase expectations and pleasure. He has never steered me wrong, sharing with me it seems similar tastes. He is also happy to take you on a tour of the wine cellar if requested. Now let’s talk about the great Tonino himself. Antonio and I were advised to go to the restaurant back in 1995 and we haven’t stopped since, except for the years when Salvatore trained elsewhere. I still dream of Tonino’s recipes and if we are lucky and Salvatore has the time he will make one especially for us: the anchovy, peppers and potato profiterole with a light pesto. Not a profiterole in the real sense as no pastry is involved, but ingredients are stacked on top of each other similar to a profiterole. A distinctive delicate appetizer bursting with layers of flavor, I had to try once my hand at making it in my kitchen in New York to gratifying success. Of course my guests had never eaten it either at the hands of Tonino nor Salvatore, nor did I have the correct ingredients, but they were suitably impressed. Convinced? For me a trip to Capri is hollow without a stop at da Tonino. Go for an appetizer and a glass of wine while looking for a bathroom after visiting the Arco Naturale/Natural Arch or the Belvedere on a cool or rainy afternoon. There are a tasting menu, a gluten free menu and a vegetarian menu, as well as an extensive list of allergens. If you are adventurous, try Salvatore’s experiments that will be an absolutely fabulous and heady treat. If by chance you love taking cooking classes, Salvatore offers classes through Cooking-Vacation (www.cooking-vacations.com, info@cooking-vacations.com). Fantastic as he is an amazingly patient and fun teacher. His humility and generosity are apparent in his style, as is his love of what he is doing. Certainly without love in the kitchen you might as well just stick with bread and water. Except, his breads are decadent and it wouldn’t be such a bad thing. He and his staff are welcoming and ready to answer questions and to patiently explain a technique or rational. Some secrets must be allowed for, but I learnt more than I ever knew in one lesson and was certainly stimulated to try new flavors and techniques. At da Tonino the experience is between a great joy and the perfect sin. “Secret” ingredients are tradition, love, respect, generosity and delight. No empty flavors here and I always leave with a sense of elation that I carry with me throughout the year while patiently awaiting my return. I was really pleased to have been asked to join Stefano Albertini and Kristina Gill at the Casa Italiana Zerilli-Marimò at NYU to talk about one of my favorite things in the world, a cook book. – My first public event I should add- I have a varied and huge collection of cook books, including those of my Italian friends’ families from various parts of Italy, so I was really happy to add Tasting Rome to my collection and I definitely have plans for it. It is my steadfast belief that history should not be taught through the numerous unfortunate wars or economic crises that have occurred. It hasn’t helped. It should be taught preferably through literature - think of Zola’s The Belly of Paris - but perhaps even more so through the cultural influence of food and the many elements that form a core part of that very essential – because we need to eat – but also intimate heritage. It is an eminent and poignant element in the passing down of family history, whether oral or written. Tasting Rome is a celebration of and a beautiful response to an attraction to the history of Rome’s food, but also to its people, or peoples, including newcomers like Kristina Gill, her co-author Katie Parla, and myself. They capture the essence of the streets of Rome in Kristina’s beautiful photography, and the food shots are about the varying surfaces, the authenticity, and the tickling of our senses. As you read the recipes and look at the images of a woman drinking from a fountain, ordinary people going about their day, the markets and monuments, and even strewn crates and boxes – we recognize all that make up a city, and in particular, this city. If you are going to visit Rome, I would suggest you take this along rather than a mere guidebook. A crucial element in this book is that our two authors, both Americans living in Rome visited markets and restaurants, some not yet on the regular tourist route, but oh so familiar and important to them. There were places that I have never heard of nor seen in my 30-year love affair with Rome, and the man I stole from it. The book combines photography of the people, façades, restaurants and street food along with the typical food photography. Our authors have selected familiar dishes linked to Roman cuisine (Amatriciana, Coda alla Vaccinara), including Jewish and the newer Libyan (Tripoli) Jewish cuisine (escabeche), and show us how to recreate them in our home, even down to making guanciale. We are introduced to the old and to the modernization, or my preferred word adaptation, of these very same dishes, and even introduced to the new cocktail culture that is sweeping Rome. All of this is combined with threads of history interwoven in the chapter intros and within the recipes. They have an easiness in the manner in which they present their choices showing their obvious familiarity and comfort with the food, the people and what is essentially Roman life and la cucina romana.